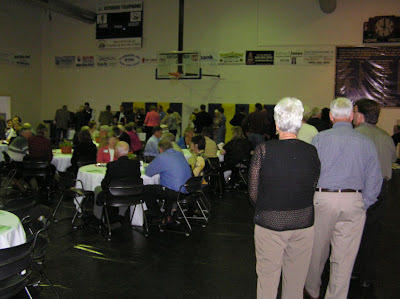 2009 LAFAYETTE COUNTY LINCOLN DINNER held MAY 1 at the Higginsville Senior and Community Center. U.S. Congressman Roy Blunt was the keynote speaker for the annual Lincoln Day gathering of Lafayette County Republicans and friends. 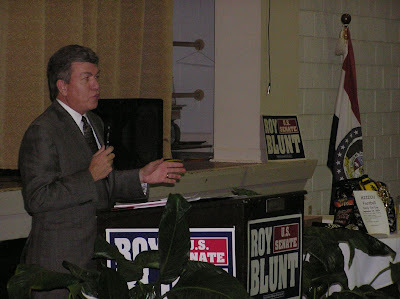 Blunt discussed what is wrong in Washington and how we can "fix" the problems in D.C. and in our country. Senator Bill Stouffer (21st District) introduced the Congressman and also discussed some issues facing the State of Missouri. A large crowd was on hand to enjoy a delicious buffet dinner catered by Nadler's of Wellington, and Virginia Bertz, past president of the Federated Republican Women's Club of Lafayette County, gave the table blessing. Linda Niendick, county clerk, led the group in the Pledge of Allegiance, and Jim Strodtman, presiding commissioner, introduced elected officials and guests. Rep. Mike McGhee (District 122nd) served as guest auctioneer for a brief live auction. Harold Hoflander spearheaded a lively raffle with all proceeds from both these activities going to the county committee to help re-elect county and statewide candidates in 2010. Rep. Stanley Cox (District 118, part of which is in Lafayette County) was a special guest. Kay Hoflander, chair, closed the dinner meeting with thoughts from Mike Huckabee's book, "Do the Right Thing."